Thought to have arrived from China in 2000 BC, latest research shows domesticated rice agriculture in India and Pakistan existed centuries earlier, and suggests systems of seasonal crop variation that would have provided a rich and diverse diet for the Bronze Age residents of the Indus valley. Latest research on archaeological sites of the ancient Indus Civilisation, which stretched across what is now Pakistan and northwest India during the Bronze Age, has revealed that domesticated rice farming in South Asia began far earlier than previously believed, and may have developed in tandem with – rather than as a result of – rice domestication in China. The research also confirms that Indus populations were the earliest people to use complex multi-cropping strategies across both seasons, growing foods during summer (rice, millets and beans) and winter (wheat, barley and pulses), which required different watering regimes. The findings suggest a network of regional farmers supplied assorted produce to the markets of the civilisation’s ancient cities. Evidence for very early rice use has been known from the site of Lahuradewa in the central Ganges basin, but it has long been thought that domesticated rice agriculture didn’t reach South Asia until towards the end of the Indus era, when the wetland rice arrived from China around 2000 BC. Researchers found evidence of domesticated rice in South Asia as much as 430 years earlier. The new research is published in the journals Antiquity and Journal of Archaeological Science by researchers from the University of Cambridge’s Division of Archaeology, in collaboration with colleagues at Banaras Hindu University and the University of Oxford. Co-author Dr Cameron Petrie says that the location of the Indus in a part of the world that received both summer and winter rains may have encouraged the development of seasonal crop rotation before other major civilisations of the time, such as Ancient Egypt and China’s Shang Dynasty. “Most contemporary civilisations initially utilised either winter crops, such as the Mesopotamian reliance on wheat and barley, or the summer crops of rice and millet in China – producing surplus with the aim of stockpiling,” says Petrie. The archaeologists sifted for traces of ancient grains in the remains of several Indus villages within a few kilometers of the site called Rakhigari: the most recently excavated of the Indus cities that may have maintained a population of some 40,000. As well as the winter staples of wheat and barley and winter pulses like peas and vetches, they found evidence of summer crops: including domesticated rice, but also millet and the tropical beans urad and horsegram, and used radiocarbon dating to provide the first absolute dates for Indus multi-cropping: 2890-2630 BC for millets and winter pulses, 2580-2460 BC for horsegram, and 2430-2140 BC for rice. Millets are a group of small grain, now most commonly used in birdseed, which Petrie describes as “often being used as something to eat when there isn’t much else“. Urad beans, however, are a relative of the mung bean, often used in popular types of Indian dhal today. In contrast with evidence from elsewhere in the region, the village sites around Rakhigari reveal that summer crops appear to have been much more popular than the wheats of winter. 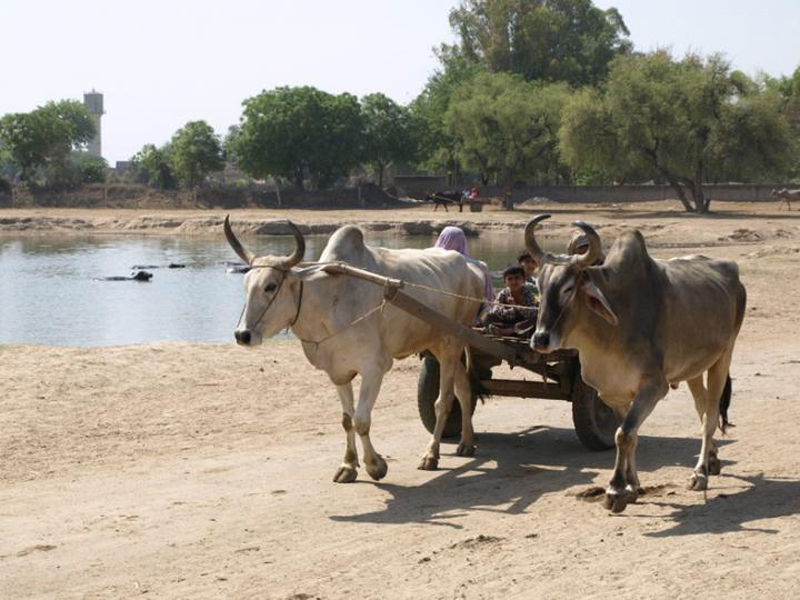 The researchers say this may have been down to the environmental variation in this part of the former civilisation: on the seasonally flooded Ghaggar-Hakra plains where different rainfall patterns and vegetation would have lent themselves to crop diversification – potentially creating local food cultures within individual areas. This variety of crops may have been transported to the cities. Urban hubs may have served as melting pots for produce from regional growers, as well as meats and spices, and evidence for spices have been found elsewhere in the region. While they don’t yet know what crops were being consumed at Rakhigarhi, Jennifer Bates points out that: “It is certainly possible that a sustainable food economy across the Indus zone was achieved through growing a diverse range of crops, with choice being influenced by local conditions. The findings are the latest from the Land, Water and Settlement Project, which has been conducting research on the ancient Indus Civilisation in northwest India since 2008.